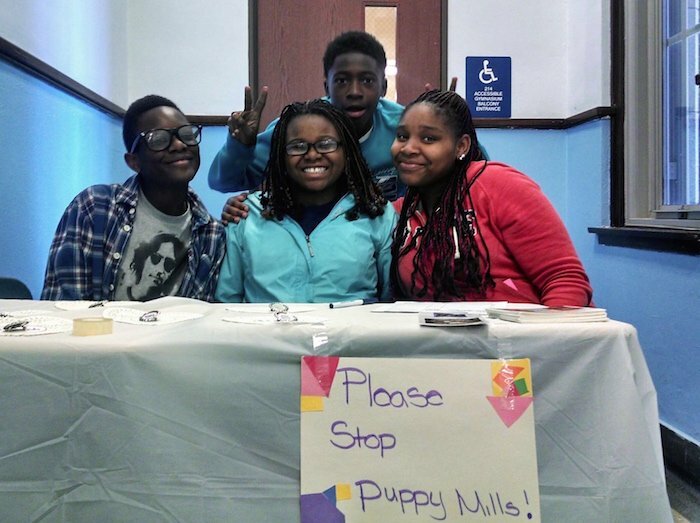 After learning about the plight of dogs in puppy mills, eighth grade HEART students at Courtenay Language Arts Center in Chicago decided they wanted to take action to help. 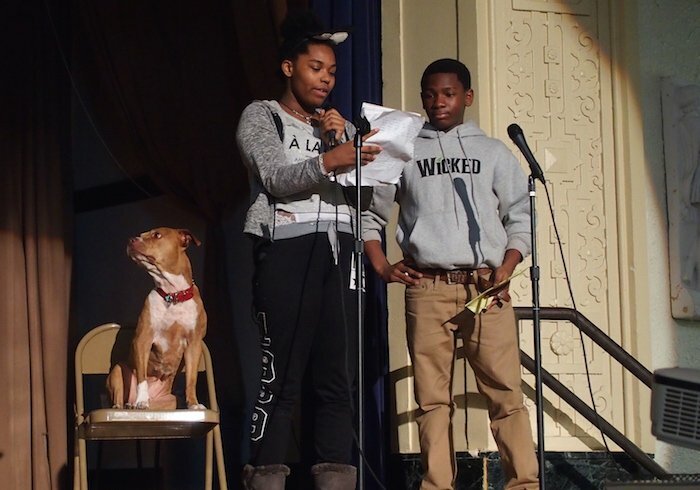 The students organized the school’s very first Puppy Mill Awareness week, helping to educate all of their classmates about the issue and how they can all help the dogs who are suffering in mills. In order to successfully pull off such an ambitious event, the students researched puppy mills for weeks by reading articles and speaking with experts on the topic so that they could fully understand the scope of the issue, and become knowledgeable enough to become teachers themselves. Once they were informed, they had to decide as a group the best way that they could make a difference for animals. Students thought of dozens of ways they could help, but had a difficult time narrowing down their ideas to one project. That is when they decided to combine all of their ideas into one big action by organizing an entire week devoted to raising awareness about puppy mills at their school. The Puppy Mill Awareness Week included daily morning announcements with facts about puppy mills, students visiting the classrooms of younger students to read Ruby’s Story (a children’s book about a dog from a puppy mill), and a basketball game fundraiser that raised $150 for a local animal shelter. We couldn’t be prouder of the students at Courtenay Language Arts Center and look forward to seeing what they’ll do for their next service project! Teaching Tip: To teach your own students about puppy mills, check out HEART’s activity “Puppy Mills Exposed” for grades 6-8 and HEART’s lesson “A Happy Home for Every Dog and Cat” for grades 3-5 in our Humane Resource Guide. You can use our video “What Is a Puppy Mill?” to educate your students about the issue. What great kids! Such compassion and drive! Their parents must be so proud!!! Puppy Mills and breeders should all be shut down!!! ADOPT! ADOPT! ADOPT!!! I'm not related in anyway to these students but felt overwhelmed and even teared up reading their story. Chicago schools can be hard and students face issues that others around the country don't but to pick this topic was amazing to me. If even only one person sees your video and gets the message you did good by the animals. For that I am grateful to you and very proud of you. Don't lose the passion and compassion. Keep spreading the word. One day enough will hear to make the changes needed to end the suffering.